Leftover Chicken? Make a Soup. Got leftover roasted chicken like we did? 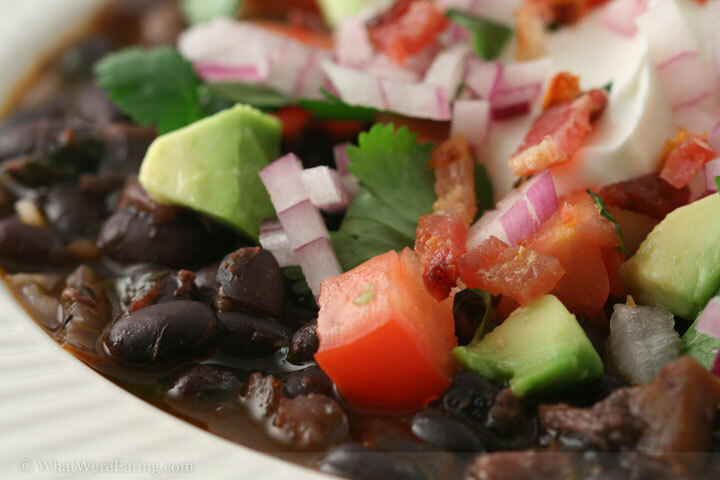 Make smokey black bean soup! For dinner we’re eating black bean soup seasoned with toasted freshly-ground cumin seeds, chipotle chiles in adobo, ham hocks, lime juice, oregano, and cilantro. Some leftover roasted chicken was added during the final stages of cooking, then the soup was served over basmati rice and topped with sour cream, vine-ripened tomatoes, avocado, whole cilantro leaves, finely-diced red onions, and slivers of crispy bacon. A: woo hoo! it’s leftovers night! not nearly as exciting as alaskan halibut night, but still. at least we aren’t letting food go to waste! T: Wow. I didn’t even realize it was leftovers. The chicken was the leftover part I take it… eh? A: yeppers. and tomorrow i’m gonna make some stock with the carcass. if i had had time today i would have made it for this black bean soup, but as it was, i worked a full day. T: This was really good. It tasted pretty authentic, I thought. Regardless of authenticity, though, it was tasty. Spicy, flavorful, and loaded with goodies. And I gotta say I loved the bowl of fresh serrano peppers. Mmm. A: for sure. and the crusty jalapeno cheese bread from Bread & Cie. it did a fabulous job of sopping up the smokey juices that the rice couldn’t quite absorb. A: as my high school french teacher would say, oh joy, oh rapture. i just can’t wait to be pestered! 😛 actually, it would be fun to be able to make this bread, it was slightly sour doughy but with a great chewy texture and fantastic flavor. it was good beyond just as a sopping device. T: yeah, i could have eaten the whole loaf. A: thank goodness you didn’t, since we had a huge pot of black bean soup to tackle! T: we still have a huge pot of black bean soup to tackle. And bread. Now that I think about it I should have eaten more bread…. it’ll go bad quicker. A: true dat. you’ll just have to binge until you purge…. JUST KIDDING! purging is bad… just go on a bread bender. T: Yeah, I generally do everything I can to avoid throwing up. Unless I’ve accidentally swallowed gasoline or something. A: woah dog. where has this conversation gone! refocus! the soup, brother, the soup! so do you have a rating for tonight’s savory, smokey pot of deliciousness? T: I give it a 4.52/5. I don’t have any complaints about it. It was super-tasty. It wasn’t as thrilling as some of the things you make, but I really can’t say anything negative about it. A: i feel ya. just a standard, good black bean soup. i totally dug it, but it wasn’t particularly thrilling. I give it a 4.36/5. I dug the fresh toasted cumin flavoring pair with all the other smokey aspects, like the smoked ham hocks and chipotle in adobo puree. It was warming and good…. just not outrageous. T: It certainly did have a nice smokey flavor. And it’s great that it was leftover food without resembling the original dish whatsoever. Bravo, Mandy. Bravo. A: gracias, senor t-lar. gracias. while i loved the roasted chicken the first time around, i didn’t really want to eat the the leftovers in the exact same form…. soups are great for leftovers! so is mac and cheese! anything can go into either soup or mac and cheese. T: I don’t know if anything can go into mac n cheese, but certainly anything can go into soup! Like that cheesy crusty bread that you’re going to make really soon, huh? Place a large pot on the stove over medium heat. Preheat the pot. Once the pot is hot, add the bacon slices. Fry the bacon over medium heat until the bacon is crispy and most of the fat has rendered out, flipping once. Remove the bacon from the pan and place onto a paper towel to drain. Using the rendered bacon fat for your oil, sweat the diced onion and carrot over medium heat. Allow the veggies to cook for about 10 minutes, or until the onions are translucent, stir occasionally. Add the minced garlic, ground cumin, chile powder, bay leaf, oregano, and black beans to the pot. Stir to combine. Allow the herbs to saute for about 1 minute in order for them to release their oils. Add the pureed chipotle in adobo. Stir. Add 8 cups of water, the ham hock, and a liberal pinch or two of kosher salt and freshly cracked black pepper to the pot then stir to combine. Raise the heat to high. Bring the pot of beans to a boil then reduce the heat to low. Simmer the beans over a low heat for approximately 1 1/4 to 1 1/2 hours, stirring occasionally, or until the beans are completely tender . Add the leftover shredded chicken and roughly chopped cilantro leaves to the pot, stir. Allow the chicken and cilantro to simmer with the soup for about five minutes, just long enough to heat the chicken through. Add the juice from 1 plump lime. Stir to combine, then taste the soup. Adjust the seasoning levels as necessary with kosher salt and black pepper. Serve the beans over freshly cooked rice and top with diced tomatoes, avocado, red onion, cilantro leaves, and sour cream. For an extra kick, add some sliced fresh jalapeÃ±os or serranos. Enjoy! I’m posting my formal complaint. Amanda, you’re making the rest of us food bloggers look bad. Could you please post less and make yuckier food. 1 formal complaint hath been entered into our “formal complaint log”. we will from here on out attempt to make our food yuckier and significantly less frequent! 😛 like we could make you look bad! all of your food is consistently good looking! Mmm.. I’m so with you on the jalapeno & cheese bread from Bread & Cie. It’s damn tasty. I almost always have a loaf in my freezer! Spam yule log would be a good yuckier start, maybe topped with an italian olive salad/whipped cream cheese “frosting” or better yet the spam could be ground up and used as a flavoring/garnish inside of a green gelatin mold, mint might be reminiscent of lamb with mint sauce, and if you got a fancy mold with a lot of detail and facets, it would be delightful, makinga great centerpiece at your next poolside cockail party, vibraphones and player not included. no joke maia! we went on a week long binder with that stuff. mmm. i heart fresh bread! heheheh i sure wouldn’t want to dive into a spam yule log. maybe i could just lick the cream cheese “frosting” off. it’s pretty bad that cream cheese is healthier than spam! have you ever looked at the nutritional info on a can of that crap?!? it’s like 32g s of fat per oz. okay, i don’t really know that for sure but i remember pat having some around rocket at some point years ago and being astounded by the fat content!